City of Wauwatosa economic positioning strategy | Vandewalle & Associates, Inc. The City of Wauwatosa Economic Development Department asked Vandewalle & Associates to help structure and communicate an innovative economic positioning strategy for the City. With significant experience working at the Milwaukee Regional Medical Center and Milwaukee County Grounds, as well as working for the City to develop the City of Wauwatosa 2008-2030 Comprehensive Plan and the Burleigh St. Triangle Plan, the V&A team was well grounded in Wauwatosa’s unique form, location and assets. Economic positioning and marketing communication. The V&A economic positioning and marketing communications teams leveraged this knowledge to create the “Wauwatosa Innovation Parkway” strategy, which draws attention and further positions the City to lead the Milwaukee Region in both attracting and growing innovative industries and quality new development. Wauwatosa Innovation Parkway: It’s all in place. Unique assets abound in this well established City. Innovation-focused businesses and educational institutions stretch the Highway 45 and Mayfair Road corridors, while highly desirable residential areas embrace the City’s parkways. Wauwatosa is also home to a world-class Life Sciences Center, which creates opportunities to capture knowledge generated by the concentration of R&D activities at the Milwaukee Regional Medical Center, Milwaukee County Research Park, and their partner institutions, for local economic growth. Rolling out the new positioning strategy. 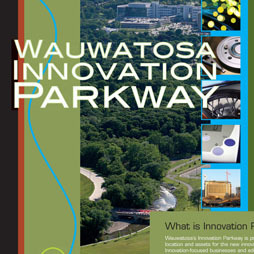 The new Wauwatosa Innovation Parkway positioning strategy was initially rolled out to regional developers, brokers, business leaders, and others at the “Great Opportunities @ Great Locations” marketing event hosted by the City in June 2011. The Wauwatosa Economic Development Department is now actively working to leverage this work to advance economic growth.